Claudia Oh Baby Chocolate Cherry is a self patterning 4 ply sock yarn individually hand painted in shades of magenta and pink for it's own unique colourway and made with an incredibly soft lustrous blend of 55% silk and 45% merino wool for shameless luxury in sock yarn. 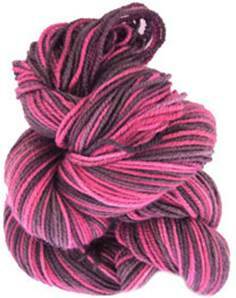 50g, 175yds and 100g will make a pair of medium sized adult knitted socks. Suggested needle size 2.5mm - 3.25mm. Claudia Addiction sock yarns should be gently hand washed as they don't have the nylon content that gives sock wools their rugged durability.